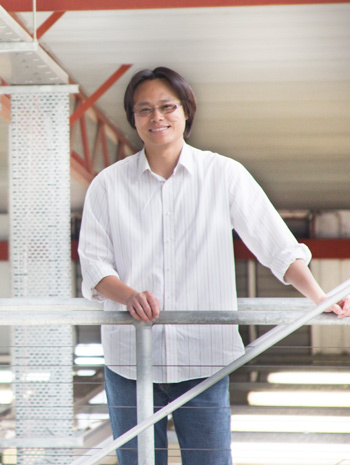 At the very core of Dr Patrick Tang’s studies is the environment. He’s tying research on global energy demands to research on concrete technology and design, ambitiously and admirably seeking to find the least costly means of heating and cooling buildings. “Energy efficiency has become a primary objective for policymakers at regional, national and international levels,” he concedes. Nowadays, the construction industry is one of the dominant energy consumers in the world and this is only expected to increase as people continue to spend more time indoors and act on their preferences for thermal comfort. Patrick’s research career began in 1999, when he commenced a PhD at the City University of Hong Kong (CityU). Principally focused on construction materials engineering during his three-year probe, the industrious academic sought to develop a new class of structural grade lightweight concretes with fibre-reinforced composite materials. “These are 1,435 to 2,100kg/m3 with corresponding strengths of 20 MPa minimum,” he describes. Joining CityU’s prestigious Department of Civil and Architectural Engineering as a Senior Research Assistant and then Lecturer after receiving his award in 2002, Patrick looked to tackle another big assignment – this time on self-compacting concrete. “This particular type has the ability to revolutionise building construction by increasing cost-effectiveness and drastically reducing noise nuisance,” he comments. Patrick relocated to the University of Newcastle in 2009, signing on to become a Lecturer and then Senior Lecturer in Construction Management within its School of Architecture and Built Environment. The talented mid-career researcher has since led a handful of successful endeavours, most recently entering into a long-term collaborative partnership with field experts from mainland China and Hong Kong. “I also won an Australian Research Council Discovery Project Grant in late 2015,” he shares. Undertaking a number of microstructure, mechanical, thermal and durability studies, Patrick is planning to investigate and optimise these properties specifically in TESA concrete. “This subtype is made of porous structural lightweight aggregate, which is impregnated with liquid phase change materials and coated with epoxy resins and mineral admixtures,” he explains. Adding another category to his ever-expanding repertoire of concretes and cement, Patrick is hoping to research sustainable construction materials in the not-so-distant future. “Photovoltaics, which involve the direct conversion of sunlight into electricity, have been receiving a lot of attention lately,” he elaborates.